A sparkling treasure situated on the north east coast of Majorca is Cala Millor, a favourite holiday destination for holidaymakers from all over Europe. It's also the largest resort on the east coast of Majorca. Tourists from around the world are known to return again and again to re-experience the relaxing atmosphere and the friendliness of the Cala Millor locals. Cala Millor can be translated to 'best cove', and just like its nearby sister Cala Bona ('good cove'), it provides visitors with one of the best beaches in Majorca. At over 1km long, Cala Millor Beach is known for its picturesque white sand and its clear blue ocean. Not only does Cala Millor Beach provide visitors with the best views around, but it also has parasols and sun loungers available for hire, water sports and wind-surfing facilities, plus easy access to the resort of Cala Bona and a pretty promenade complete with shops and restaurants. 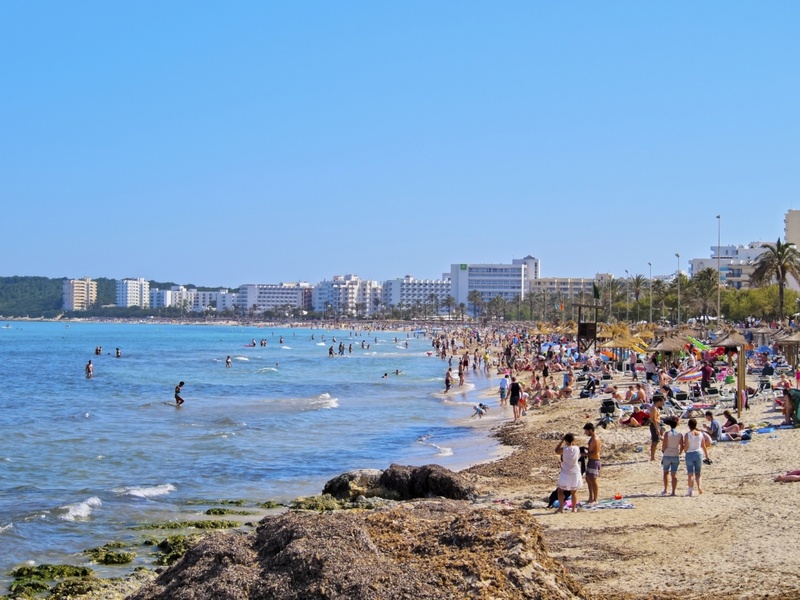 It's easy to see how Cala Millor came to be such a popular holiday destination. The golden sand, blue sky and aquamarine water of its beach create a paradise. Rugged cliffs and distant mountains provide a contrast for the bay's tropical beauty. The numerous hotels along the bay are complementary to the island's beauty, providing guests with sparkling pools and luxury landscaping. The shops and businesses in the town centre showcase the Medditerranean flavours, in white washed and pastel adobe buildings. Visitors to Cala Millor can sample the local cuisine and have a leisurely lunch at an outdoor café, all of which are complete with incredible views of the sea. After doing so, tourists have the opportunity of walking off their filling lunch through the streets lined with exotic palm trees and top-quality shops. If walking isn't really for you, take a ride on the Badia express, a quaint mini-train that connects to all the other nearby resorts. Those who like to take time to play a round of golf whilst on holiday certainly won't be let down. The Mediterranean breeze and surrounding beauty are the perfect setting for golfing, and the closest courses to Cala Millor are Son Servera, Pula, Capdepera and Canyamel. Son Servera is the second oldest in Majorca, is a 9-hole course and is popular amongst British members, whilst Pula is certainly one of the more exclusive and luxurious courses. As for Capdepera and Canyamel, the views are simply spectacular. Food is always a must to experience wherever you go on holiday, and Cala Millor is definitely no exception. There are many great restaurants and cafés for dining, all providing a range of local and international cuisines. Sample the local Spanish cuisine at 'Restaurante Perla del Mar', or try a slice of the much-loved pizza at Carlo's. No matter what your preferences regarding food are, Cala Millor has something for everyone where dining is concerned. After watching a glorious Meditteranean sunset, it will be time to experience the nightlife of Cala Millor. Visitors can drink the best sangria and enjoy international music at one of several bars and night spots. Disco Karussell and Palace Q are the most popular clubs in the resort, and a night out Cala Millor style isn't complete without a visit to one of these. Find information about selected Hotels, apartments and rooms in Cala Millor to choose the perfect place for your accommodation.